"One Hundred Years of Vicissitude"
Thrown into the milieu are saké, B-29s, Lewis Carroll, Sir Thomas Malory, Melbourne, The Wizard of Oz, and a dirigible - along with the allusion that Red Riding Hood might just be involved. Some of the most rewarding books I read over the years proved to be the ones that didn’t come with too many recommendations or from the authors I picked in the whim of my reading caprices. One such novel was “Tobacco-Stained Mountain Goat”, a wonderful novel for which I didn’t have any recommendation and implicitly with any expectations from my part. Of course, after the initial encounter with an author it proves to be very difficult to read the writer’s next work without any expectation and only with the anticipation of opening a door to a new world. There is no wonder then that it was impossible for me not to set the bar of expectations high for Andrez Bergen after his debut novel, but if that changed the way I perceive his future works it also made me await them with eagerness. 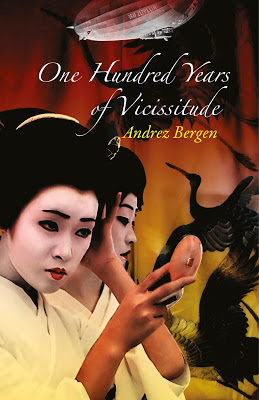 The first in line, Andrez Bergen’s new novel, “One Hundred Years of Vicissitude”. “First up, a disclaimer. I suspect I am a dead man.” What the main character only suspects in the beginning becomes obvious immediately after that. Wolram E. Deaps is dead and he finds himself in a limbo. A transitional situation for which he has no explanation or from which he has no escape yet. But the state Wolram E. Deaps is in it’s not completely cut off from the state of living Wolram is familiar with. Along the story of “One Hundred Years of Vicissitude” Wolram learns on his own that the state of transition in which he is found comes with childhood dreams reflected on this limbo, with significant physical needs, for instance cold and hunger. But nb also is a place with new possibilities, such as meeting new people. And Wolram E. Deaps meets Kohana. Together they begin a journey through the memories of the former geisha, a pilgrimage to the significant moments of her life, the events that shape Kohana’s character and her former existence. Is the recounting of a life, with the good, the bad and in between, a flash of an existence before death exerts its final toll. With the only two main characters on the scene “One Hundred Years of Vicissitude” is similar in many aspects with a play. Much of the story’s magic consists in the relationship between these two characters, but without neglecting the story in the least. Each act of the story takes place in a different setting, the props are changed from one moment in Kohana’s life to another, with the necessary revisiting of the most important ones. The entire odyssey is made in the accompaniment of witty dialogues, delightful characters and captivating story. Or little stories, since the entire picture of “One Hundred Years of Vicissitude” is made by smaller parts that could easily make a tale on their own. But the characters do not make solely a voyage through Kohana’s life memories, it is also an expedition through a certain era of Japan’s history. It is a hymn brought to this wonderful country and to some of the elements that define its individuality. Customs, history, legends, literature, music and pop culture receive homage in Andrez Bergen’s novel. The ritual of drinking saké, geishas, kabuki, monster movies, yakuza or sumo are some of the things that find their way into the novel one way or another. I said that after reading an author for the first time it is almost impossible for me to start the writer’s other works without some expectations. Such was the case with Andrez Bergen too, but nothing I expected based on “Tobacco-Stained Mountain Goat” could have prepared me for what I found in “One Hundred Years of Vicissitude”. Yes, both novels have witty, intelligent and delightful dialogues, both show a mastering of language and an assured writing technique from Andrez Bergen, both with various odes brought to the things I can only guess that the author loves at personal level. But “One Hundred Years of Vicissitude” reveals new qualities of Andrez Bergen, in particular a warm and wonderful sensibility. The description of Asakusa 1945 firebombing and the reminder of the cruelties of Nanking massacre are touching and emotional. These would have been enough to show Andrez Bergen ability to create emotion, but there many more sensible moments. Distinctly, two scenes from the end of “One Hundred Years of Vicissitude” bring the reader close to tears. Globalization is very far from the milk and honey heaven we are led to believe it brings, but I am thankful for the possibility it gives me to discover writers such as Andrez Bergen, an Australian, living in Japan and enchanting the readers across the globe, such as myself, with the stylish noir post-apocalyptic “Tobacco-Stained Mountain Goat” or this little gem that is “One Hundred Years of Vicissitude”.